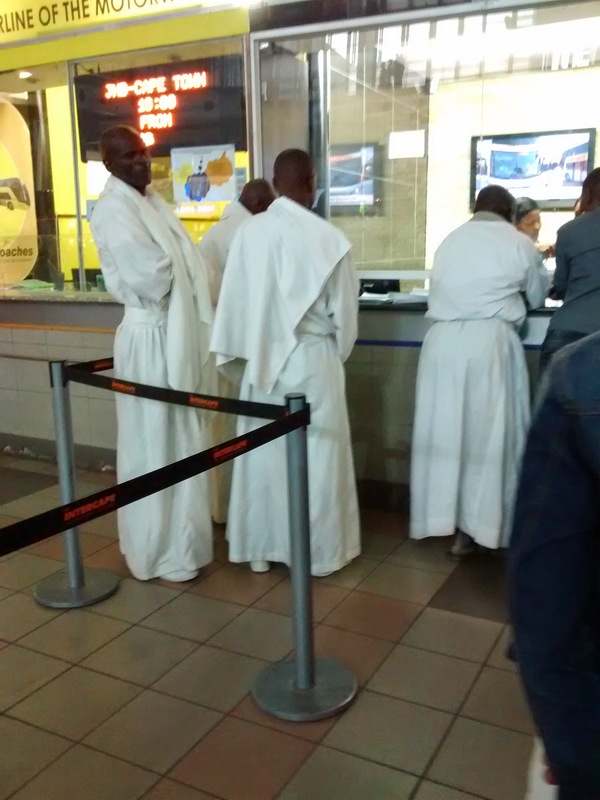 Waiting to purchase my ticket behind the four wise men, actually members of the popular apostolic or Zionist Christian sect. They put much emphasis on Old Testament Biblical scriptures. The question still begs asking: why would anyone in their right mind actually want to take a coach or bus through Beit Bridge? I asked myself that question several times during the interminable wait. We’d made reasonable time, departing Park Station, Jo’burg at 1800 hrs, arriving at BB border post around 0200. My coach ticket reassuringly stated that we would arrive in Bulawayo at 0800 later that morning, only 6 hours away…plenty of time I imagined. In fact what would I do if we arrived early I worried? Would there be somewhere inconspicuous to sit and wait whilst I waited for my lift? He was referring to the widely acknowledged state of affairs whereby countless Zimbabweans were employed in almost every sector of the South African economy, most visibly in the restaurants, pubs and gardens of Johannesburg, Pretoria, Durban, Cape Town and surrounds. Nonetheless, we were through the SA side before too long and not more than 20 minutes later were trudging into the customs and immigration offices on the Zimbabwean side of BB. The bridge itself spans the Limpopo River, invisible in the dark at that time of the night. It had been a good four years or so since I had last negotiated ‘the Bridge’. 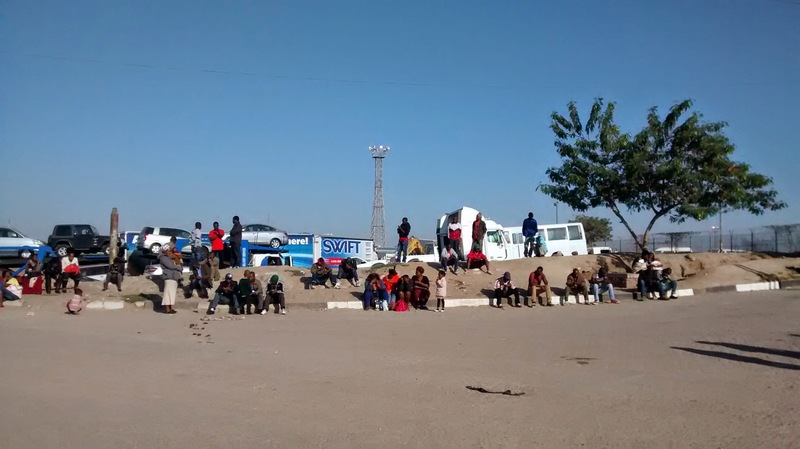 Despite a small saving over air travel of about R600 I was curious to see what life was like for the citizens of my home nation as they negotiated the notoriously cumbersome border control point. At immigration I was obliged to buy a visa (single-entry) for 55 USD since I now traveled on a British Passport. The official I dealt with treated me with ill-concealed disdain. I have no idea why considering I could be a first time visitor come to spend some much sought-after hard currency. I stood around for about 20 minutes whilst another official, a younger lady, disappeared with my 70 USD, presumably looking for change. From there it was over to the customs and excise side. No matter how many times I’ve negotiated that border post I still find myself uncertain as to whether or not I should declare one or other of my electronic devices or other valuables. I asked one of the drivers who advised me not to declare the valuables but only the goods. Well that was helpful. I assumed that by ‘goods’ he meant those items intended for resale. I decided against a declaration since all I had of value was my mobile phone and the tablet I’m compiling this on. After I emerged from immigration I was surprised and pleased to see that the Intercape bus was backing up against the customs control point where we would presumably be searched, a formality everyone went through. I stood around whilst the driver struggled to align the bus. Eventually a compromise was reached – not straight but with enough of a gap for other traffic to pass by if necessary. And when I refer to ‘other traffic’ I allude to the several hundred metres of buses and trucks backed up behind the control point. The penny only dropped after I tried to board the bus to recover my hand luggage, only to discover a collection of passengers who looked completely unfamiliar, not to mention annoyed that I was trying to board the bus as they were attempting to disembark! In an inspired moment I thought to ask a passenger the destination of the bus to which he answered, Harare. Trudging back a good hundred yards or so to the correct Intercape bus, which bore an uncannily similar number plate tothe Harare-bound one, it dawned on me that it would be a long evening. Almost all the other passengers were back on board and getting some more sleep. It wasn’t even 3 a.m. I put my earphones in and listened to an hour or more of music until fitful sleep overtook me. We edged forward bit by bit and by the time dawn broke we were close. A short while later we disembarked, told to take our luggage from the trailer and to form a semi-orderly queue on the grimy tarmac which was embedded with myriad bottle tops and other miscellaneous organic and inorganic items. 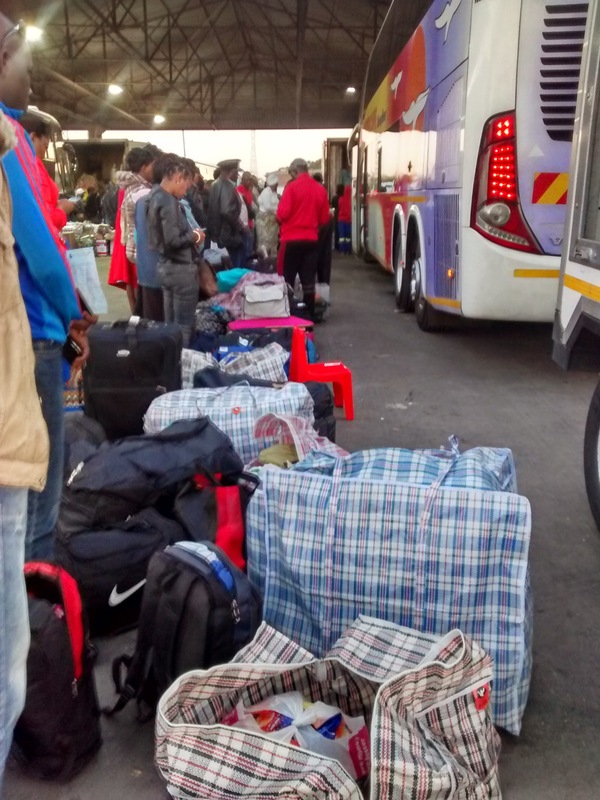 An illustration of one of the delights that awaits the hapless traveller at the border post: queueing outside the bus at dawn with all ones belongings on display. For a while I stood there in the cool of the early morning until it occurred to me that I was the only one wearing only a T-shirt. I dug into my cabin bag and extracted a wind-cheater and then strolled to the back of the queue, trying my best to remain surreptitious. My photo of the moment speaks for itself – a desultory queue of passengers standing beside their bags, resigned to wait for however long it might take. An hour elapsed and still no sign of our officials. After perhaps another 45 minutes two customs officials, a man and a woman, sauntered down the line of bags, poking one or two at random but looking largely disinterested. They were done in two minutes. After the protracted wait that’s all the time it took. 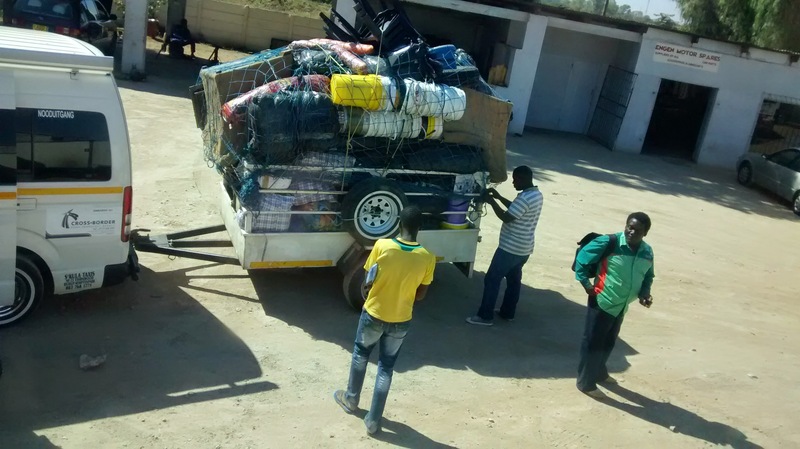 A typical trailer laden high with goods for resale in the Zimbabwe. I took this photo once we had crossed into Zimbabwe. Alas, we weren’t permitted to get back on the bus until it had been searched. We were instructed to wait further ahead on the other side of the control point. Probably another two hours elapsed at this juncture, the sun steadily arcing upwards in tandem with the temperature. I chatted to my neighbour on the bus, a young Ndebele lad working as a security guard in a mall near Johannesburg airport. It didn’t sound like a great job: periodic armed robberies punctuating the general monotony of the job. However, with his wages he’d managed to buy a car of which he seemed proud, though he didn’t yet have a license. “Have the police caught you yet?” I asked him, to which he replied that they had but a R50 back-hander had been enough to quash any charges. After a while I got my phone out to take another picture of the listless passengers sitting on the perimeter kerbs. A few people standing nearby observed me intently and one man about ten yards from me sauntered across. 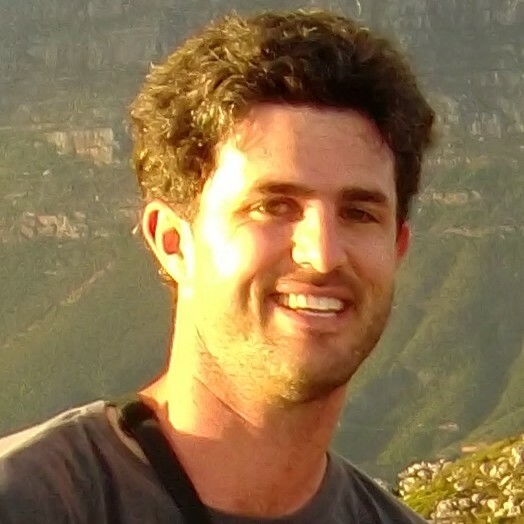 He flicked some sort of security ID from his pocket which suggested that he was a plain clothes CIO agent, one of the countless members of the government security apparatus playing the role of Big Brother. “I’m just a tourist,” I insisted. At this I just smiled amiably and he chuckled in turn before turning serious. “No pictures!” he reiterated once more before sauntering back to his mates. Phew, that was a bit close for comfort. At least he didn’t ask me to erase the photograph. They’d been known to destroy whole spools of film if they deemed the photographer had committed some violation or other. However, I was in for a pleasant surprise once I reached Bulawayo where I would discover that the independent press enjoyed more freedom of speech than I could remember for many years. Passengers bask in the sun waiting for their transport to clear customs and immigration. Eventually, around 10 am, 8 hours after our arrival at the border post, we were finally authorised to proceed. Our last inspection officer had stood by the side of the bus with his arms crossed facing away from us for the better part of those last couple of hours by which I deduced that we had not paid the relevant facilitation ‘fee’ but more on that in my next chapter. To conclude, I am sure there are other border posts out there to rival or indeed surpass Beit Bridge in terms of tedium, bureaucracy and inefficiency but I certainly hope to avoid experiencing them in my lifetime! Beit Bridge is quite enough. Thanks for this memory jag, Leo! Oh the tedium and irritation and helplessness as there is nothing to do but submit to authority if you want to get through… infuriating! I doubt I would have remained as calm as you did. Enjoy ‘Blue Skies’ Byo!